Current students can find information about campus resources and area organizations in the accordians below that can help them make the most out of their experience at Temple University. To view current course offerings for TFMA, visit the Banner Course Catalog. Additional see the TFMA Scholarships page for funding opportunities in the division. 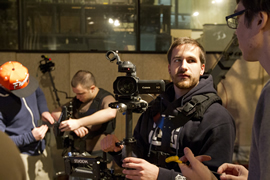 Students in the film program can find information about the cameras, audio equipments, dollies and more on the Equipment Room page. The Writing Center's mission is to provide individual support to writers across the university. Through their academically-diverse tutoring staff, conversation partners and attentive office assistants, the Center provides one-on-one support for writers and for English Language Learners. Learn more. Math and Science Resource Center provides a variety of services to students including Learning Assistance Workshops, Review Session and online and in-person tutoring for all students enrolled in math, science, statistics, and other quantitative courses. The student-centered learning facility, led by content qualified peer tutors, is designed to help all students achieve their highest potential. Learn more. Centrally located on Main Campus, the Paley Library holds the majority of the University Libraries' book and journal collections in most subject areas, including business, humanities, the sciences, and social sciences. It is also home to the University Libraries' administrative offices, the Special Collections Research Center, Urban Archives, the University Archives, the microforms collections and reader/printers, and a limited number of study rooms. Full listing of library resources and service can be found online. Learn more. Theater students are encouraged to contact Anne Harlow, Reference Librarian for Music, Dance, and Theater, for assistance in research. Students may also access discipline specific information sources and research guides online. Film & Media Arts students should contact Brian Boling, Reference Librarian and Media Services Specialist for assistance. Film & Media Arts reference guides can be found online for research subjects and FMA course assignments. Serving all Temple students and alumni, the Career Center provides a full range of services to optimize internship and employment opportunities and enhance life-long career success. Students can attend information sessions, participate in mock interviews, go to on campus career fairs, and more. Learn about the Career Center. Learn more about theater career resources. Learn more about film and media arts career resources. The founder of Temple University, Dr. Russell H. Conwell, believed that education should be available to anyone on the basis of their intellectual and personal motivation, regardless of their income. Temple University's Student Financial Services office readily assists all Temple students in making their college education affordable. Learn more. Temple University offers incoming and continuing undergraduate students numerous scholarship opportunities to assist you in financing your education. Some scholarships support students from across the university. In addition, each school and college offers scholarships specifically for students enrolled in their programs. In most cases, students must be enrolled full-time and seeking a degree in order to qualify for these scholarships. Learn more. Each year the Division of Theater, Film and Media Arts gives several awards to undergraduate and graduate students based on acheivement and need. Criteria and required application materials are described on the TFMA Scholarship page. Departmental scholarship committtees review the applications and may work with the nominees to help insure applications best represent the student's strength. Learn more about the TFMA Scholarships. Grants are often called “gift aid” because they are funds that do not have to be repaid. Grants are often need-based, while scholarships are usually merit-based. Grants are funded by the federal government, state governments, and Temple University. Learn more. Federal Work-Study allows students to earn money to help cover non-billable educational expenses by working within Temple University, at an off-campus employer or for nonprofit organization. Before seeking a position, a student must receive an award letter with a work study award and accept it within the TUportal. Learn more. Student Health Services provides many of the same offerings as your family doctor, centrally located at 1810 Liacouras Walk. With convenient walk-in hours and appointments, Temple's staff of highly qualified doctors and nurses can meet all of your healthcare needs. Learn more. The Wellness Resource Center (HEART) provides students with wellness education, resources and prevention services to help you make informed choices about your health. Most services are free or low cost, and all are confidential. Learn more. To help you identify, understand and resolve your issues, the Counseling Services offer free, confidential services, such as one-on-one counseling, support groups and educational programs. Learn more. Temple University Campus Recreation, a department within the Division of Student Affairs, is the coordinating office for recreational sports programs on main campus. These activities include intramurals, sport clubs, informal recreation, special events and programs, group fitness, adapted recreation, aquatics, and student staff development. Learn more. Getting around town: Southeastern Pennsylvania Transportation System includes a network of buses, trollies, subway, and trains, serving Bucks, Chester, Delaware, Montgomery, and Philadelphia Counties. Visit septa.org for more information. Getting around the region: Several area resources are available for travel to New York City, Baltimore, and Washington, DC. Check out Amtrak, Bolt Bus, Greyhound and Megabus. Campus Philly is a nonprofit organization that fuels economic growth by encouraging college students to study, explore, live and work in the Greater Philadelphia region. Learn more about CampusPhilly. Since 2002, PhillyFunGuide has been the Greater Philadelphia region’s “go-to” web site for accurate and detailed information about upcoming cultural, entertainment and sporting events. Administered by the Greater Philadelphia Cultural Alliance, the site contains information on thousands of events and attractions. Check out Philly FunGuide. Uwishunu is the official tourism blog of Philadelphia for Philadelphians who want to know more about everything new and exciting happening in the city and the surrounding region. Uwishunu is the source for what’s fresh on the restaurant, art, music, theater, and sports scenes in Philadelphia. From restaurant openings, new menus and chef dinners to theater shows, museum exhibitions and special events, they’ve got the full scoop on how you can fill your nights and weekends with some of Philadelphia’s best activities. Check out the blog. The region is defined by its creative sector, by the organizations, people and creative expression that make Philadelphia one of the most exciting cities and regions of the world.The Greater Philadelphia Cultural Alliance (GPCA) works on behalf of that community, providing tools, research and resources for the field. GPCA host a Job Bank with an extensive listing of arts and culture jobs, internships, and volunteer opportunities. Learn more about GPCA. Serves the regional independent media arts community by providing educational programming, networking opportunities and industry workshops. Greater Philadelphia Film Office (GPFO) sponsors an annual screenwriting competition, organizes local film premieres, and manages a job listing of film-related opportunities. Learn more about GPFO. The Philadelphia Film Society (PFS)’s mission is to utilize film’s unique capacity to engage a broad cross-section of the community, while further providing access to powerful films from around the world in order to increase education and understanding. PFS presents the annual Philadelphia Film Festival, a showcase of over 100 films around the city, and operate PSF at the Roxy, a historic theater in Center City, that shows independent new films and educational programing. Visit the PFS site. International House is a leading venue in Philadelphia for repertory film programming, independent premieres and cutting edge avant-garde cinema from around the world. Go to the site.